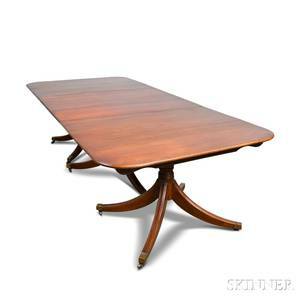 Millender Triple Pedestal Dining Table, 20th C.
Millender Furniture Company (American (Burlington, North Carolina), 20th century), contemporary. 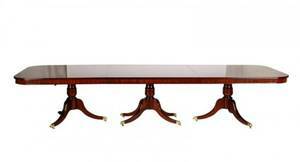 Three-section mahogany triple pedestal dining or banquet table of standard form with curved ends and satinwood string inlay decoration and rosewood banding above a reeded edge and veneered apron, each section supported on a thick baluster shaft issuing downswept legs, the middle section with four legs, the end sections with three, all terminating on brass lion's paw feet above wheeled casters. 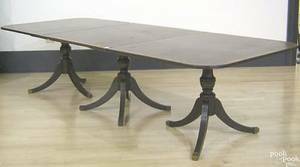 Affixed labels on underside identifying manufacturer. 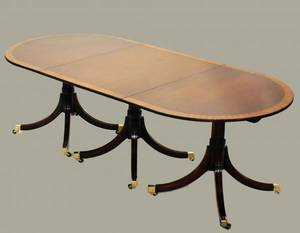 Overall approximate height 29.5", width 52.5", depth 144.25". 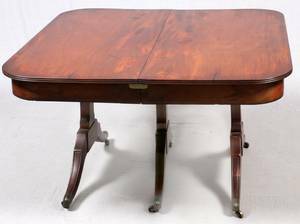 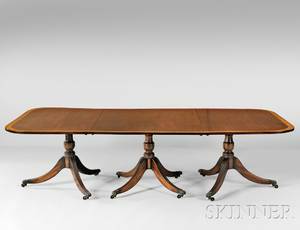 Archived auctions similar to Millender Triple Pedestal Dining Table, 20th C.
MAHOGANY TRIPLE-PEDESTAL DINING TABLE 19TH C.